Hello and welcome back to another Forgotten Hope 2 devblog. 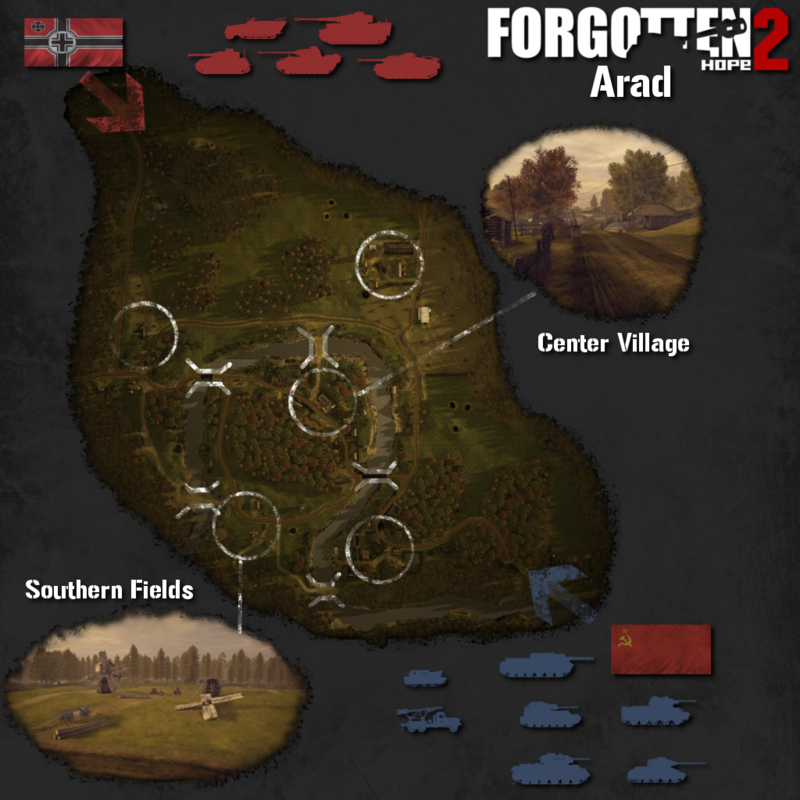 With the release of Forgotten Hope 2.5 imminent, I thought it would be a good idea to take a closer look at the 5 new maps that will be released with it. On the 14th of September 1944, the 2nd Ukrainian Front under General Malinovsky launched it's own Belgrade Offensive in conjunction with the 3rd Ukrainian Front. Six days later Arad was captured by Romanian and Soviet troops after engagements with Hungarian forces. By the end of September 1944, Malinovsky and General Friessner had received new orders. Malinovsky was now ordered to attack towards Budapest from the salient to the south around Arad, meanwhile Friessner's orders included an attack from Oradea to slice through the Soviet lines and capture the Carpathian passes. With the start of the Battle of Debrecen on the 6th of October 1944, Malinovsky's southern pincer was attacking near Arad slicing through the Hungarian Third Army. The attack by the northern 2nd Ukrainian Front pincer ran into difficulty quickly though, colliding with two panzer divisions of the German III Panzer Corps - the 1st and 23rd Panzer Division. 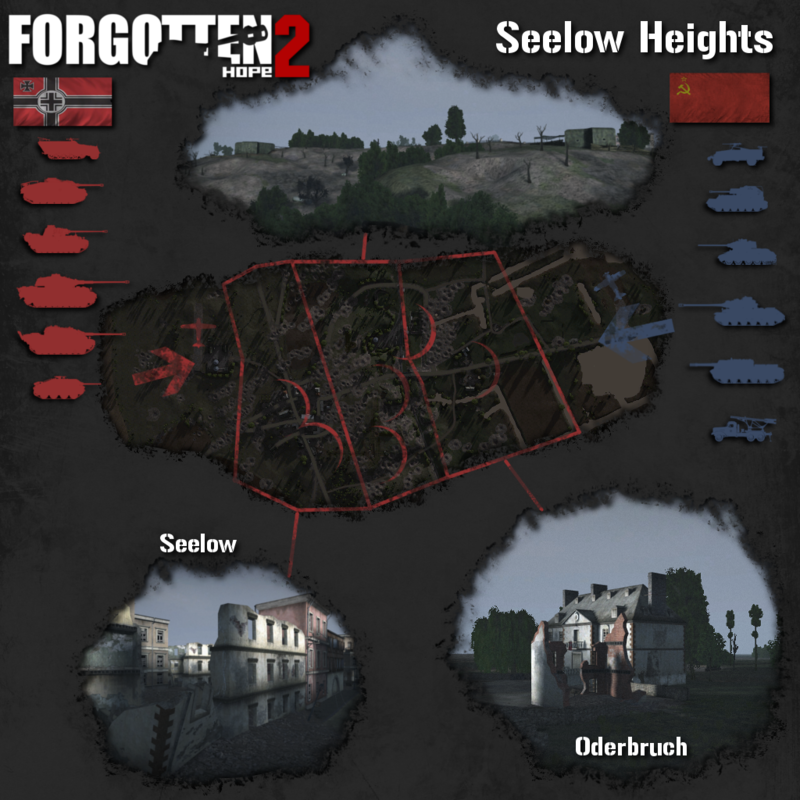 This map was inspired by the popular Red Orchestra map of the same name. Germans and Russians will clash in a rural Hungarian landscape characterised by forests, small villages and fields. A river divides the battlefield in two parts, making controlling the fords and bridges crossing it of the utmost importance. Both sides have a varied selection of late 1944 vehicles and equipment, up to heavy tanks and tank destroyers. While the tanks duel in the fields, the infantry can stalk them from the woods or occupy some of the villages and farm buildings scattered across the map. This allows for various playing styles and tactics to be used. 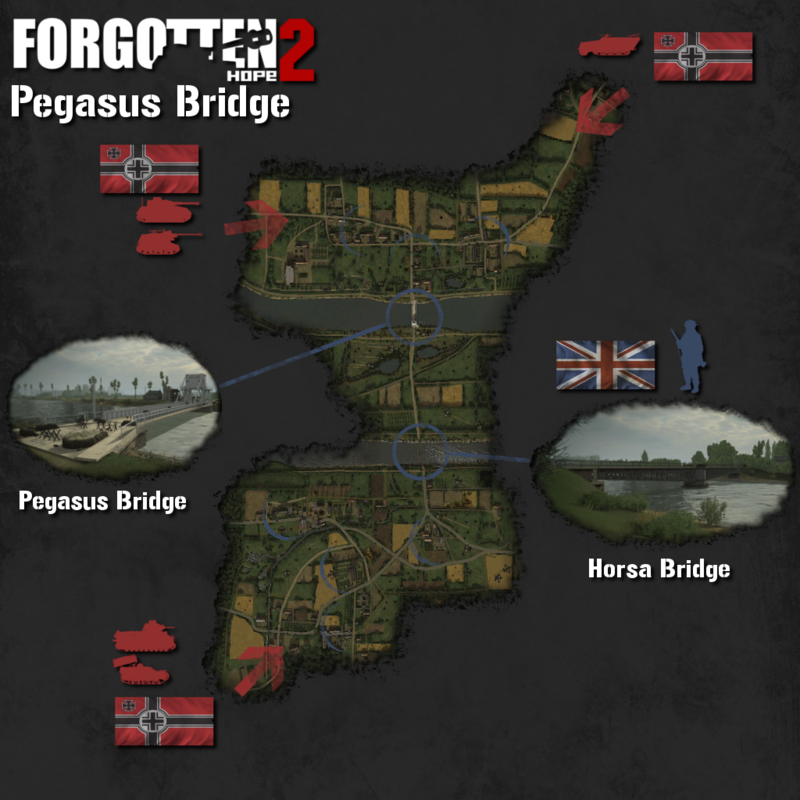 The first objectives of D-Day were two bridges spanning the Caen canal and Orne river, codenamed "Pegasus" and "Horsa". The plan called for a glider-borne surprise attack in order to overwhelm the ill-equipped defenders as fast as possible. After this was accomplished, the paratroopers were to dig in and wait for reinforcements coming in from Sword Beach. While this part of the plan worked well, the Germans reacted quickly and as the sun rose on the morning of the 6th of June 1944, tanks and armored infantry of the 21st Panzerdivision closed in on the beleaguered bridgehead. This map is unusual, and not only because it is the only one set in France released in 2.5! The German objectives are the iconic Pegasus Bridge, as well as the nearby Horsa Bridge. How they achieve their goal is up to them: They can attack the British perimeter from one of three mainbases. The British paratroopers will have to mount a defense on all sides shifting their forces from one hotspot to the next in order to keep the Germans and their tanks at bay. Will they be able to hold out until reinforcements from the beaches arrive? This setup is made possible by the new "adaptive push" gamemode, which will also be put on several older maps. The two bridges and the Chateau de Benouville have been faithfully recreated. New British paratrooper models and captured French tanks in service with the 21st Panzer Division round out this authentic and unusual map. The smallest map in the upcoming patch, this one is focussed on infantry fighting. The forested terrain, zig-zagged by Finnish trenches, favors the use of submachine guns and hand grenades, while the few Russian tanks supporting the assault will be easy pickings for Finns armed with Panzerfausts and satchel charges, not to mention the various antitank gun emplacements. 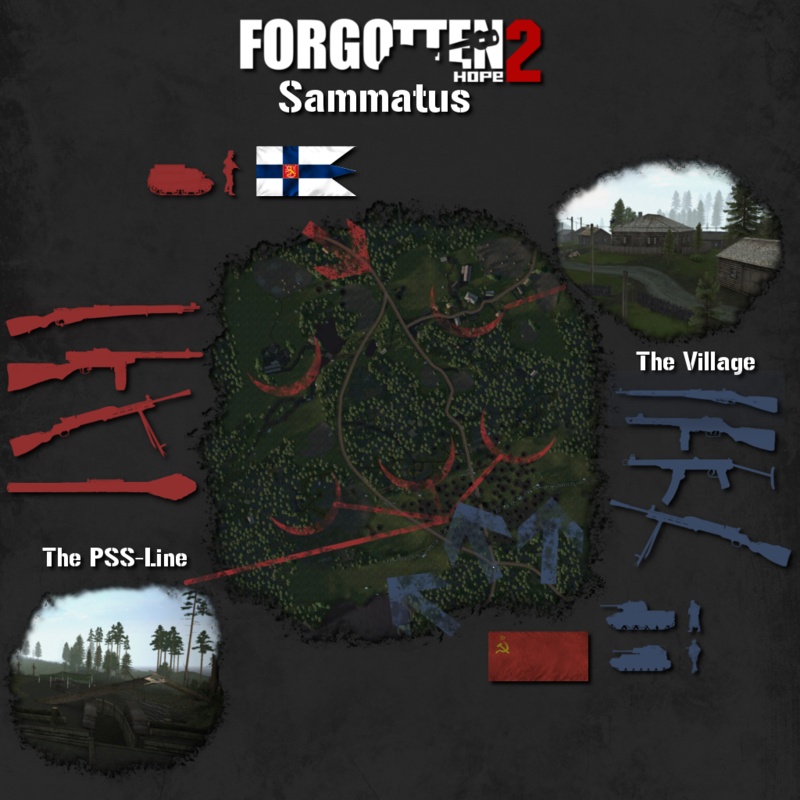 If the Russians manage to break through the PSS-Line into the Finnish hinterland, they will still have to clear the village of Sammatus itself. On the 8th of September 1944, elements of the 1st and 4th Ukrainian Front began an offensive through the Carpathian mountains with the aim of gaining their first foothold in Slovakia and supporting a resistance uprising there. What was supposed to take a handful of days dragged out into many weeks as Soviet forces ran up against stiff resistance from the 1st Panzer Army and 1st Hungarian Army. On the 25th of October, a major tank battle broke out in the valleys west of the village of Dobroslava, as Soviet forces tried to outflank remaining German positions. The fighting was fierce enough that the area came to be known as The Valley of Death. This map is characterised by long line of sight and a rough and hilly terrain, with valleys cut into the mountains by clear creeks and streams. On the slopes of the so called "valley of death" German and Russian tank wrecks and craters serve as cover for more tanks and infantry men, as new forces are fed into the battle. In the nearby village of Kruzlova, the Germans have a powerful reverse slope position, allowing them to shell any Russian tank cresting the hill with long range antitank fire. On this huge, autumn themed map, tankers can prove their skills at duelling over great distances, as T34s and Panthers face each other in the Carpathian mountains. After more than 5 years of fighting, the Second World War is drawing to a close. Only one major obstacle stands between the Red Army and their ultimate prize: the capital of Germany, Berlin. The remnants of the once mighty Wehrmacht are digging in on the Seelow Heights, a commanding terrain feature overlooking the flat Oder river plains, muddy and flooded in this cold, wet spring. The battle opens to the thunder of 20000 guns pounding the German positions. This is not only the last map in this list, but also the latest map in FH2, set in April 1945, shortly before the end of the war. As in real life, the Red Army has a huge material advantage in tanks, artillery and planes, but they will need it: The terrain is open, the Germans are well dug in and every ditch, every bunker and every bombed out house might have a Panzerfaust lying in ambush. In this sector push map, the Russians have to clear three areas: The Oder river valley, dominated by a manor and a trainstation, the heavily fortified Seelow Heights and the completely destroyed village of Seelow itself, where the Germans have barricaded themselves in an apartment complex and a church. It might be the last battle, but it won't be an easy one! Awesome descriptions and great graphic. Well done. All of them look marvellous. Cant wait! Amazing. As per usual, stunning detail and graphics. I am always amazed what kind of optical quality you guys could create with only the refractor engine. Any confirmation wether or not there will be Bot support on 2.5 release? If only partly, which of these have a navmesh? Last info afaik is there wouldn't be Coop support, but maybe something has changed? There won't be coop support because we don't have a navmesher atm. I really want to play Sammatus!!! This is the first modern dev blog! And this is what FH2 needs!! Just look at grafic of pictures above!! Thanks for the clarification. Such a shame, I hoped you might have found someone to do the navmesh. I'll have to work on a temporary fix for that in the meantime and see what is possible. Do you guys want to make any aditional Africa and France maps in the future? Or were that all major battles? Not that I wouldn't want the eastern maps, I'm just curious. I won't promise anything, but there is a possibility that you might see some more Western European maps in the future. But this is dependend on a couple of different circumstances, especialy of how much time devs can spent on future content in their spare time. EF is the focus right now and there is still some interesting stuff for after 2.5 in the pipeline. Anyway, 2.5 is finaly coming and that's what has most attention right now. there is still some interesting stuff for after 2.5 in the pipeline. "Smaller, more frequent updates", they said. Nobody said anything about "small"
Jokes aside, we can't predict development timelines. This release is the best example of how plan can change. According to how stuff works with 2.5, there might be some adjustments or hotfixes needed, similar how stuff was handled with Omaha for example. So incase maps have serious issues we will have to adress them in a timely fashion. For the stuff in the pipeline we will handle it as always: so it is done when it's done. Ofcourse we hope to get it delivered asap, but as you know, FH2 is a hobby for us and not our daily job. Though sometimes it doesn't seem like it, when I look a Gavrants commitment.